Sunday, Oct. 2 at 2 p.m.—BRANDON—Following a 10 year period designing for Hallmark, Belmont artist Stephanie Stouffer had a 35-year career as a freelance artist. She designed more than 1,500 original gouache paintings used for licensing by companies like Caspari, Certified International, and Peking Handicrafts. However, after being scanned for use on mugs, tapestries, greeting cards, pillows, rugs, and more, the original paintings collected in piles in her studio closet. The imaginative and whimsical designs were never exhibited or offered for sale—in fact, many having never been seen by anyone but Stouffer and her licensing agent. With a personal, first-hand experience of truly earning a living as a freelance artist, Stouffer will give a gallery talk at the Compass Music and Arts Center, as part of her current exhibit “The Creative World of Stephanie Stouffer,” on Sunday, Oct. 2 at 2 p.m. She will discuss the demands and frustrations of staying “on top” of the market, of staying creatively fresh and innovative while meeting the commercial interests and time demands of manufacturers. The exhibit showcases many of Stouffer’s original paintings, along with selected licensed products, and represents a significant chapter of her life’s work. It runs through Oct. 29. The Compass Music and Arts Center is located in Park Village at 333 Jones Drive, Brandon. For more info, visit cmacvt.org. 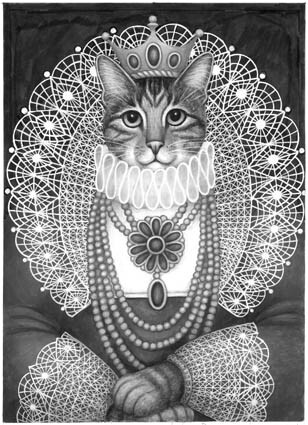 “Queen Bess,” gouache on archival Strathmore illustration board, is part of an exhibit by artist Stephanie Stouffer displaying at Compass Music and Arts Center.